This is a strategy to not loose and it is the only sensible strategy President Trump can pursue. The reality is that every one on every side of this conflict is tired of it. America is certainly tired of it as every one knows. But the Taleban may actually be more tired of it. That movement has splintered & now the splinters are getting further splintered. They know they have no hope of victory if America decides to stay on ad infinitum with say 10,000 troops. It will be a low intensity inexpensive conflict that America can wage for decades if necessary. Heck, even NaPakistan is tired of it because they are now getting a Talebani blowback from Afghanistan back into NaPakistan. So why doesn’t it simply peter out? Because of the commitment of one entity, one large player to this conflict. It is not the NaPakistani Government or the people of NaPakistan. It is the officer class of the NaPakistan military that needs this conflict to keep their control of that regime, a control that has been extremely rewarding to them. They were the creators of the Taleban, they were instrumental in managing the war of the Taleban to win most of Afghanistan in 1990s. The NaPak military has been single-handedly responsible for supporting, funding & arming the Taleban even after September 2001. And they have benefited mightily from it. If President Trump wants to make any progress in reducing the Talebani pressure on the Afghan government, he has to order the US military to begin offensive, pre-emptive operations in the border areas occupied by NaPakistan. But what about the sacrosanct “sovereignty” of NaPak? This is a big deal. The United States cannot willynilly attack sovereign territory of another nation without repercussions. So what is the solution? It is quite simple & legal, actually. The official & officially stated position of Afghanistan is that the 1893 agreement forced on Afghanistan by the British Government of India is now ex-parte and thus invalid. 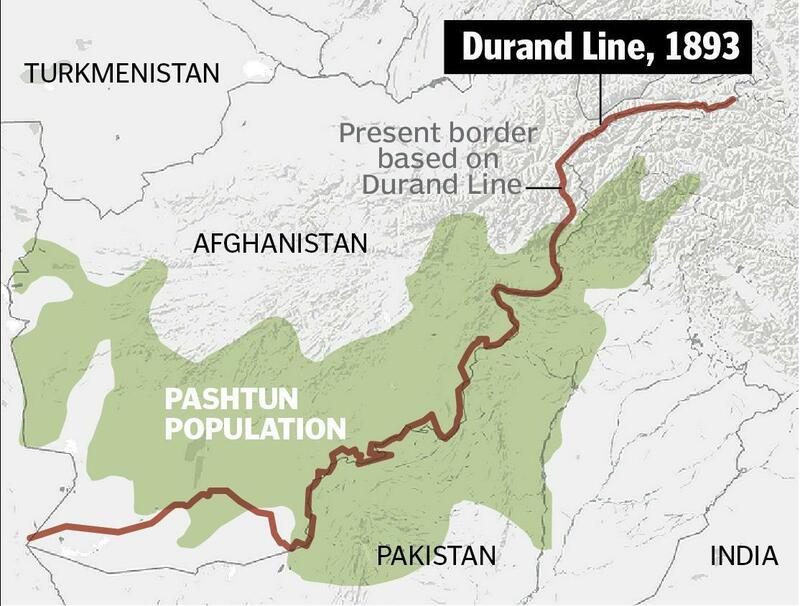 The Afghan Government has claimed, since 1949, that the Durand line is no longer valid and that NaPakistan is illegally occupying sovereign territory of Afghanistan. It would be a relatively simple matter for today’s Afghan Government to officially permit US forces in Afghanistan to operate in these Pashtun lands illegally occupied by NaPakistan. This would automatically change the legal status of these Pashtun areas from sovereign territory of NaPakistan to that of a disputed territory. This would enable the US forces to operate inside these areas under the permission of lawful government of Afghanistan. This is exactly what China is doing in the South China Sea and what China is attempting to do in the areas it claims in the Himalayan mountains. This is a major step without question. But NaPakistan cannot afford to get into this dispute with the United States acting as an agent & military protector of Afghanistan. Losing the Pashtun areas would be devastating to the NaPak military and, if they believe the Trump Administration is serious, they would be amenable to letting US forces operate in these areas under the umbrella of a joint US-NaPak anti-terrorism operation. We are not sure whether the Trump Administration or the Pentagon is willing to go this far but we are absolutely sure that they cannot make any progress in Afghanistan without this step of operating in the Pashtun areas occupied by NaPakistan. The Trump Administration has another ace to play to force the NaPak military to cooperate. President Trump took an initial step in his speech when he asked India to play a greater “economic” role in Afghanistan. Economic, Schemeconomic, we say! The Trump Administration should demand from NaPakistan government a land route between India and Afghanistan to enable India to deliver real economic assistance to Afghanistan. The Obama Administration tried to persuade NaPakistan Govt to grant such a route but they refused. The Trump Administration should make this a non-negotiable demand. What if NaPak military refuses? The stick has to be recognition by America of India’s position that all of Kashmir, including areas occupied by NaPakistan, is sovereign Indian territory. That is the ultimate poison pill for NaPakistan. And that gives leverage to the Trump Administration to demand a land route between India & Afghanistan. This is not easy but it is doable if the Trump Administration is deemed to be deadly serious by the NaPak military. Seriously, nothing would be more beneficial to the economic development of Afghanistan than a real land route between India & Afghanistan. It would make Afghanistan a central node on a corridor between Central Asia and India. It would also open up an alternate route for American supplies to reach Afghanistan. It would, as a corollary, increase trade & add to the economic development of areas of NaPakistan that lie along this India-Afghanistan-Central Asia route. It would take very serious pressure from the Trump Administration including a credible threat to recognize all of Kashmir as sovereign Indian territory to make this road happen. But such road would be a first step towards rescuing Afghanistan from its current trajectory of becoming a failed state as well as a first real step for an eventual American withdrawal from Afghanistan. It is important to recognize that the General Class of the NaPak military has gotten rich from their control of the NaPak regime. We suspect much of their undeclared wealth is held outside NaPak, probably in friendly financial territories of the Middle East. The Trump Administration could quietly but seriously attempt to seize the financial holdings of NaPak generals held outside NaPakistan. At least, they could threaten to leak the details of these holdings to friendly media for publication. The NaPaki people love their military today. But would they continue to love them if they see how much of their country’s wealth has been looted by their generals? As you can see America has many options & many ways of turning serious heat on NaPaki military & its generals. But neither the Bush Administration nor the Obama Administration had any serious interest in doing so. They were content to let America’s venture in Afghanistan stay on a low burner while they focused on other issues. In contrast, President Trump sounds serious. But whether he is truly serious will be determined by what his Administration does in the next couple of years.